Paddles temporarilly removed. 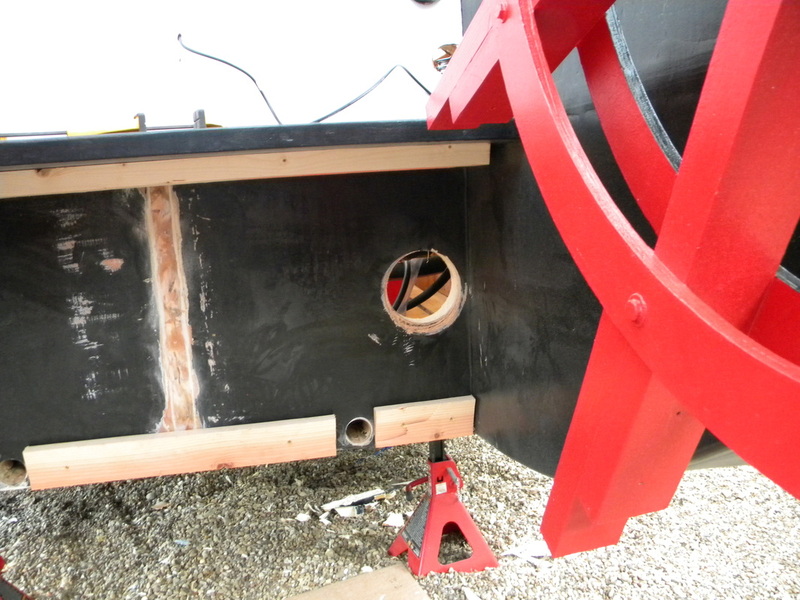 Removed the rudder, drain plugs, and exhaust port. 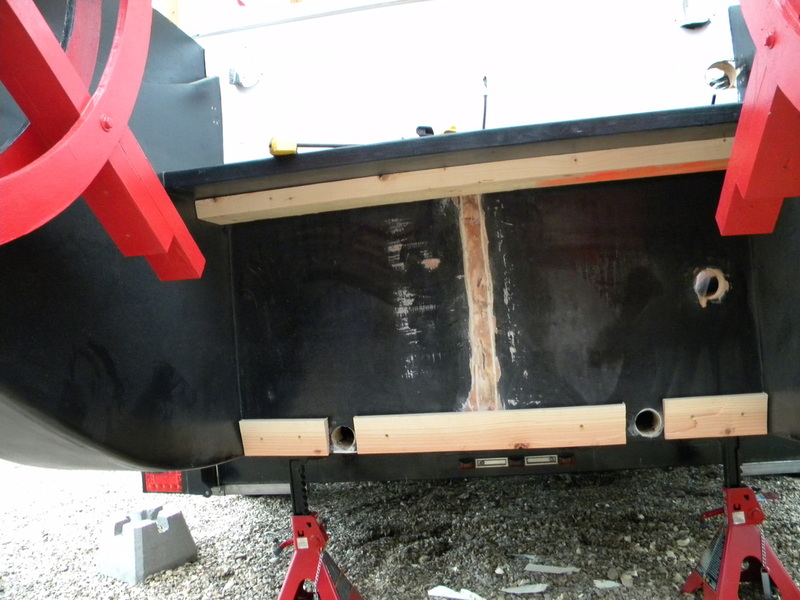 Going to have to move the boat back on the trailer, if I don't want to fiberglass the boat to the trailer at the same time I fiberglass the new tansom in. 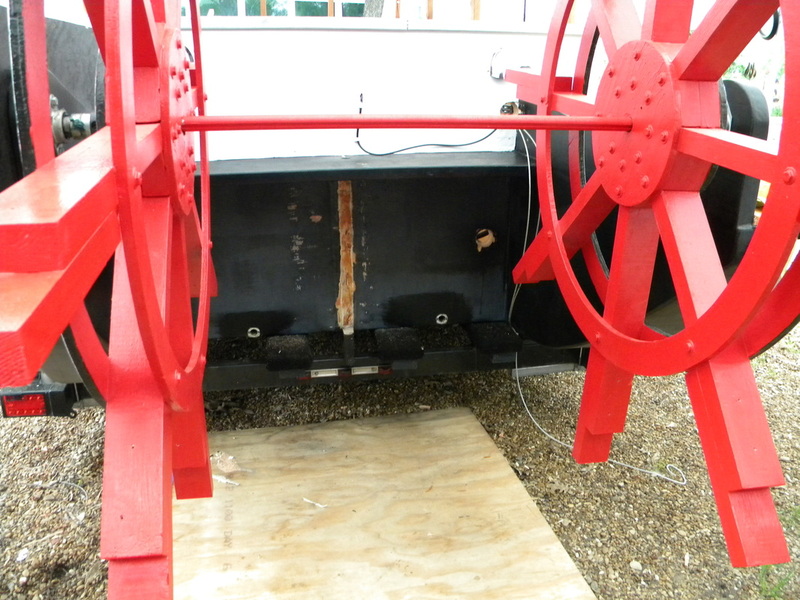 Using two airpowered jacks and four supports, we were able to get the boat off the trailer. 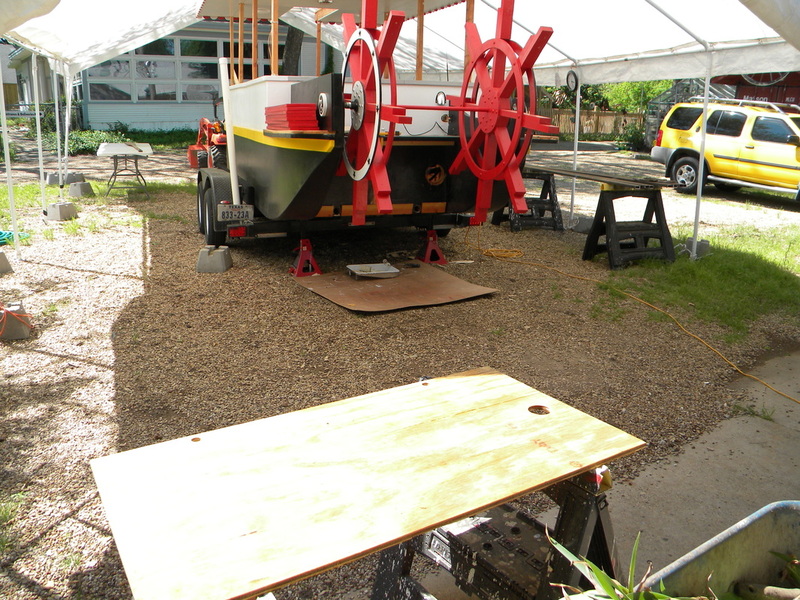 With the trailer moved about a foot foward, we lowered the boat back onto it. 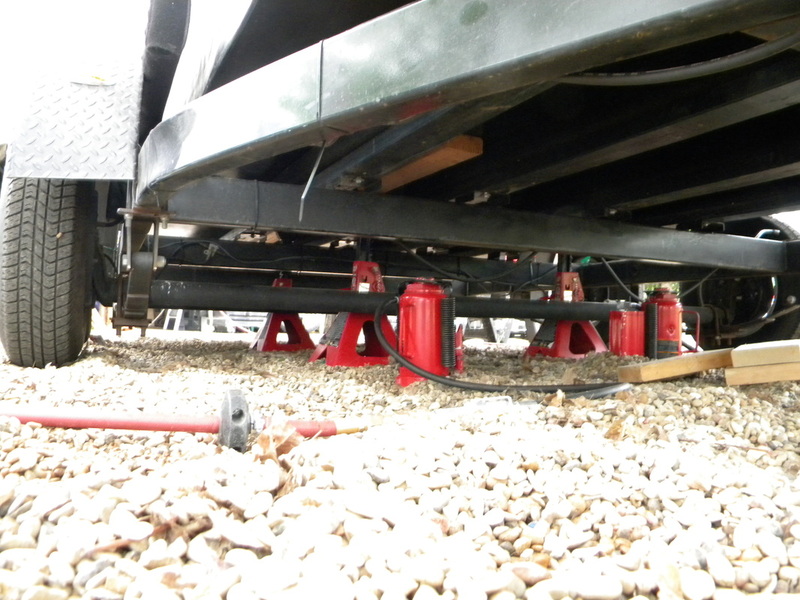 We also used two of the supports to ensure the boat does not tip the trailer. I used a 2"x6" as a brace for the new tansom at top, and 2"x4"s for the bottom. Also enlarged the drain holed. 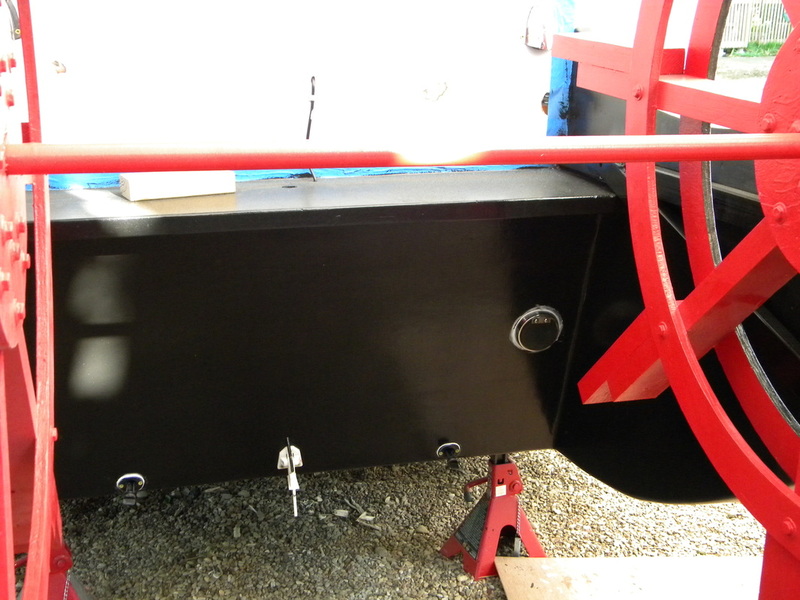 Going to drill new ones in the new tansom to fit the drain plugs into. Also will drill new exhaust port hole and speed odometer tube hole. 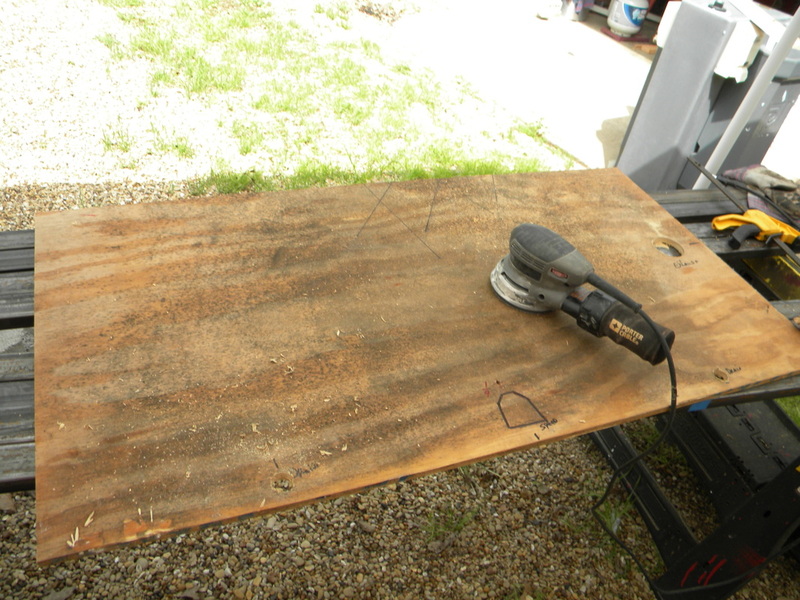 I cut the boards with a 15 degree angle to ensure a nice flush fit for the new tansom. 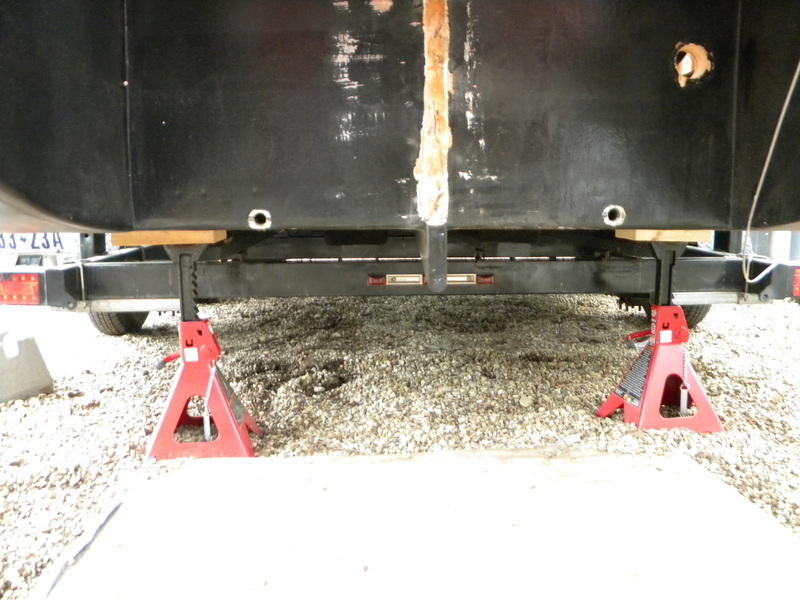 Test fitting the new tansom. 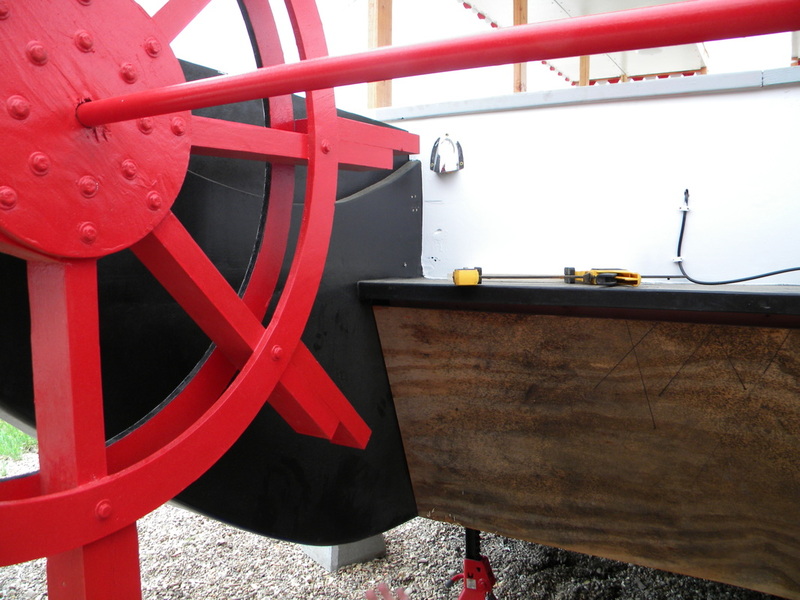 The 15 degree angle should ensure nice water flow under the boat when the paddlewheel is in reverse. 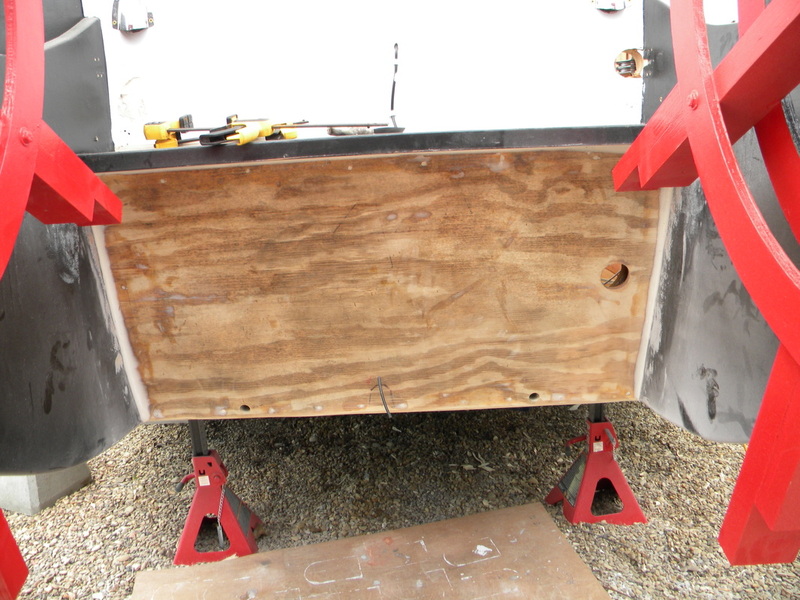 Holes drilled in new tansom, and now just a nice sand job before sealing it all to ensure it is water tight. 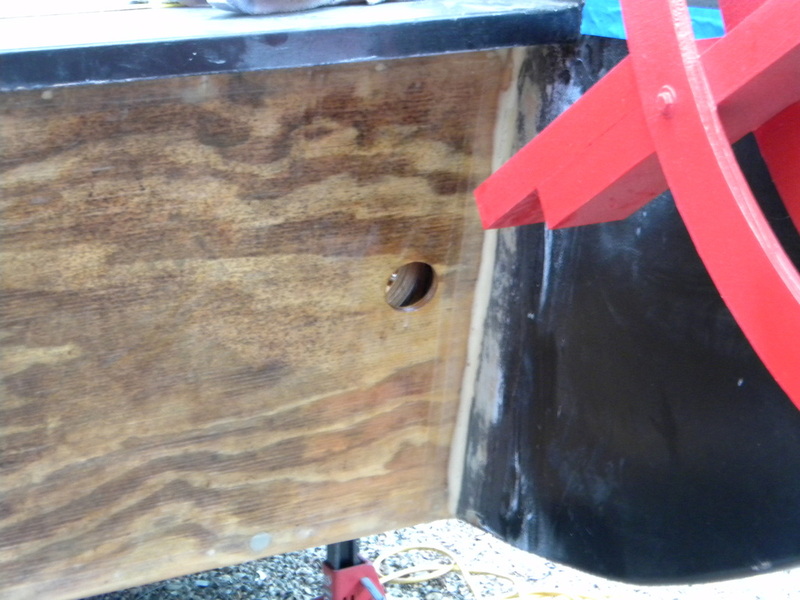 Decided to enlarge the first exhaust hole so I could stick my hand through it easier to tighten exhaust port back nut. New tansom instaled, puttied the corners and sanded them smooth. Now just apply the fiberglass tape. 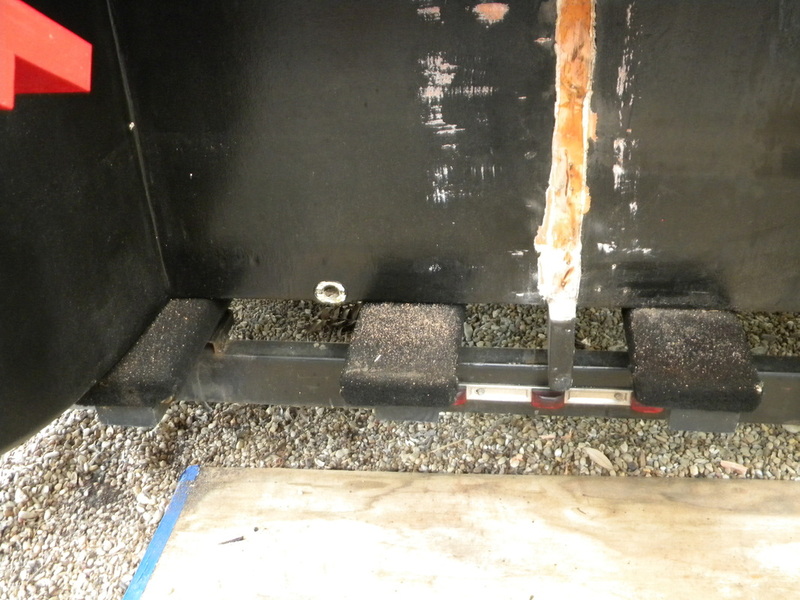 Double taped every corner with 4" and 3" fiberglass tape. Soon as I the last coat of resin dries, I will sand, prime and paint.